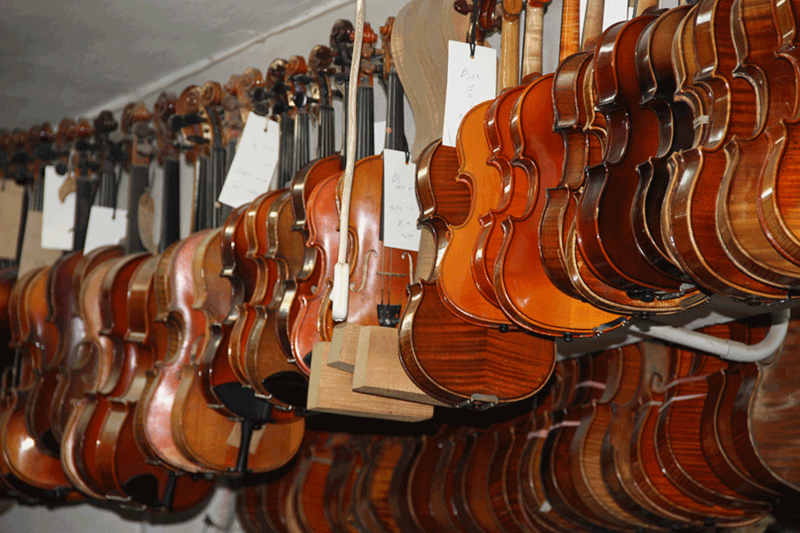 CLEVELAND – More than a half dozen organizations across the community have come together to bring the historic Violins of Hope to Northeast Ohio this fall. Played before and during the Holocaust, the instruments have been painstakingly restored and serve as testaments to the resilience of the human spirit and the power of music to lift hearts in even the most horrific of circumstances. Among the organizations inspired to partner on a project combining performances, educational programs and a major exhibition are: The Cleveland Orchestra, Case Western Reserve, the Cleveland Institute of Music, Facing History and Ourselves, ideastream, the Jewish Federation of Cleveland, and the Maltz Museum of Jewish Heritage. Amnon Weinstein, a second‐generation violin‐maker based in Tel Aviv, Israel, has collected and repaired more than 45 Holocaust-‐era violins from around the world, some with the Star of David on the back and others with names and dates inscribed within the instrument. The violins have been played in concerts around the world, most recently by the Berlin Philharmonic in late January of this year. The Cleveland visit will mark the violins’ second trip to the U.S. The violins first came to this country in the spring of 2012, when the University of North Carolina Charlotte hosted a two‐week visit. UNC Charlotte musicology professor James A. Grymes published Violins of Hope: Violins of the Holocaust – Instruments of Hope and Liberation in Mankind’s Darkest Hour last year and is curating an exhibition of the violins at the Maltz Museum of Jewish Heritage that runs from Oct. 1 through Jan. 3, 2016. Among the highlights of Violins of Hope Cleveland will be a September concert featuring The Cleveland Orchestra, under the direction of Franz Welser‐Möst, which will dedicate newly renovated Silver Hall, part of Case Western Reserve’s Milton and Tamar Maltz Performing Arts Center at The Temple – Tifereth Israel. Members of the Cleveland Orchestra will play the restored violins, while the Israeli violin virtuoso Shlomo Mintz also will perform with one of the instruments. The hall is named for The Temple’s longtime leader, Rabbi Abba Hillel Silver, who also was among the leaders in the effort to establish the nation of Israel after World War II. ideastream, the region’s nonprofit public media organization that includes WVIZ/PBS, 90.3 WCPN, and WCLV 104.9 Classical, will record September’s Violins of Hope Cleveland Concert live for broadcast by WVIZ/PBS and WCLV Classical 104.9 radio. ideastream also will develop a half‐hour documentary highlighting Northeast Ohio’s experiences with the project as well as individual stories involving the instruments. Local students also will have ample opportunity to participate in public programming, and to consider the violins within their classrooms. The Cleveland regional office of Facing History and Ourselves has scheduled teacher workshops and is developing lessons and other materials for Northeast Ohio educators to use. Facing History is an international non‐profit education organization dedicated to using lessons from history to encourage students to consider how their own choices can make a positive impact on society. The Cleveland Institute of Music (CIM) Orchestra, meanwhile, will present Music of the Violins of Hope, a free concert for the community at Severance Hall on October 14 in which CIM students play the restored violins from the Holocaust. In addition, CIM will present several faculty and student concerts featuring chamber music of the time, including music written by composers held in concentration camps. CIM's Distance Learning program will support the project's education efforts with offerings that prepare students and area residents for their visit to the exhibition and concerts. Violins of Hope Cleveland is a community‐wide collaboration that aims to inform, educate and inspire people throughout the Midwest. Played by Jewish prisoners in Nazi concentration camps, the instruments have been collected and restored by Israeli violin maker Amnon Weinstein for more than two decades. The historic violins have been played in concerts from Jerusalem to Berlin and Charlotte, NC, and provide a rare opportunity to explore unique stories behind each instrument and the individuals who owned them. Throughout the fall of 2015, a diverse range of nonprofit organizations will sponsor performances, lectures, an exhibition and other public programming. The partners are: The Cleveland Orchestra, Case Western Reserve, the Cleveland Institute of Music, Facing History and Ourselves, ideastream, the Jewish Federation of Cleveland, and the Maltz Museum of Jewish Heritage. For more information, please visit violinsofhopecle.org.